Estate planning is primarily about settling two issues: distributing property to surviving heirs and limiting one’s exposure to liability for death-related taxes. In line with the second issue is the question of settling a loved one’s remaining debts after death. All estates which pass through probate, which is a substantial number, must provide notice to outstanding creditors of the death and the opening of the estate, so claims may be filed. Dying without some amount of debt is extremely rare, as at the least, most people will have outstanding medical bills related to their final days. Spouses and other surviving family members often wonder and worry if they may be legally obligated to assume these obligations and become personally responsible for the debt. Further, there is the related question of how much of the deceased’s estate will be taken up by creditor claims, and how that would impact the property remaining for distribution to heirs. A discussion of who is liable for debt after death, and how to limit the reach of creditors of assets belonging to the deceased, will follow below. Who Is Responsible for Debt? a family allowance of up to $18,000 for a surviving spouse, dependent heirs, or lineal descendants if the spouse is deceased as well. Of course, only those assets classified as probate assets are available for creditor claims, and a person’s homestead, as well as assets that are not solely listed in the deceased’s name at the time of death, are exempt from this process. Thus, the goal of any good estate plan is to limit the number of assets that have to go through probate in order for inheritance to take place. Financial accounts, life insurance policies, and retirement benefits with beneficiaries other than the deceased’s estate pass outside of probate, and are not subject to these types of creditor claims. 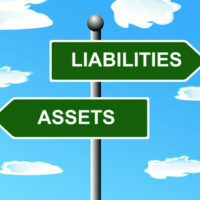 One of the most popular and effective options generally used for asset protection are trusts. These legal entities are designed to take away management, control, and ownership of property, and place this power in a trustee, who manages the trust assets for the benefit of the beneficiaries. Because of this arrangement, the property is no longer considered to belong to the person who established the trust, and creditors have no right to collect against this property. One important point to note about trusts, though, is that revocable trusts do not automatically enjoy the same treatment, and these assets may be liable to pay taxes, creditor claims, and estate administration costs. If preserving estate assets for heirs is a priority, working with an experienced estate planning attorney is crucial to getting the right structure in place to properly shield property from outside claims. Your life’s work should go to family and friends after death, not to the government and creditors. If you are worried about protecting your financial legacy, talk to William Rambaum about your estate planning needs. Attorney Rambaum helps Florida’s seniors for decades address all their end-of-life, inheritance, and asset protection needs. Contact the Oldsmar office to schedule an appointment.